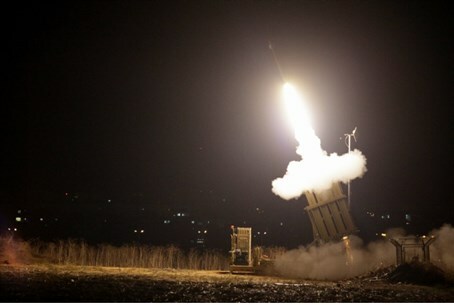 Reportedly, a rocket was shot down by the Iron Dome anti-missile defense system over Modi'in. Rocket sirens on Thursday night were sounded just ten minutes before 9 p.m. in Modi'in, as well as several communities in Samaria, and the Shfela lowland region between the Jerusalem hills and the coast. Reportedly, a rocket was shot down by the Iron Dome anti-missile defense system over Modi'in, about 25 minutes' drive from Jerusalem, but residents of Jerusalem reported hearing several booms, indicating there may have been more than one rocket fired at the region. Hamas's "military wing," the Al-Qassam Brigades, took credit for the attack, saying they had fired a domestically produced M-75 long range rocket towards Modi'in. The attack came only a short time after five rockets were fired at Be'er Sheva where a man in his forties was hit by a car while running for shelter. Earlier a 33-year-old man in the Eshkol Regional Council was wounded by shrapnel while protecting children with his body. Hamas has recently followed a pattern of raining missiles on the communities in the Gaza environs through the course of the day, and at night targeting major cities in an attempt to create terror and panic as millions of urban residents are forced to run for shelter. This formula was seen on Tuesday night, after Gaza terrorists breached the ceasefire with a three-rocket salvo on Be'er Sheva at 4 p.m.
That night, rockets were fired on cities including Tel Aviv and the coastal Gush Dan region, with the Al-Quds Brigades claiming to have fired domestic M-75 and Iranian Fajr 5 rockets at the area. It also included a rocket on Jerusalem that was intercepted by Iron Dome just before midnight. Wednesday night was markedly quieter, with just one rocket launched at the southern Israeli town of Ofakim. That discrepancy may be related to the fact that Israel attempted to assassinate Al-Qassam Brigades chief Mohammed Deif; whether the attempt was successful or not remains unclear. The IDF strike was followed by the assassination of three senior Al-Qassam Brigades commanders in a pre-dawn pinpoint attack Thursday morning.